Nmap it's the best network security scanner tool over the last 10 years on all major Operating Systems. more about nmap at the end of the post ! It is compiled from real Nmap source code by some developers to support android devices. ANmap is an android tool that you can use on a network to determine available hosts, services, operating system versions, types of packet filters/firewalls and other characteristics. so if you root your device to run ANmap on it be very careful to which application you give access to run as super user! note if your phone if not rooted you wont see that window. 1-Enter the IP address of the target in the top-right box. 2-Then tap on "nmap" button. Nmap (Network Mapper) is a security scanner originally written by Gordon Lyon (also known by his pseudonym Fyodor Vaskovich) used to discover hosts and services on a computer network, thus creating a "map" of the network. To accomplish its goal, Nmap sends specially crafted packets to the target host and then analyzes the responses. it can be used to discover services running on Internet connected systems. Like any tool it could potentially be used for black hat hacking, as a precursor to attempts to gain unauthorized access to computer systems. it is more often used by security and systems administration to assess networks for vulnerabilities. System administrators can use it to search for unauthorized servers, or for computers that do not conform to security standards. Nmap is related to vulnerability assessment tools such as Nessus, which test for common vulnerabilities in open ports. The included NSE scripts that are packaged with modern versions of Nmap are able to perform vulnerability checks against discovered services. 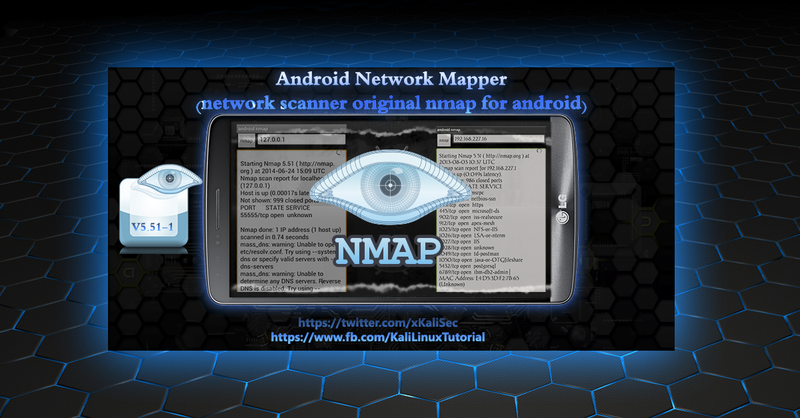 why Nmap is ported to android ? why not ! Nmap is used everyday by thousands of network professionals to keep their systems secure. Nmap's documentation describes itself as a "network exploration tool and security scanner," and it has excelled at these complex capabilities. Nmap tracks down the Wild West town's citizens, identifies each person, and checks them over for potential security gaps. All of these scans are configured, launched, and recorded using nmap's built-in capabilities. With nmap, the Wild West's network becomes a safer and more comfortable place to live. and Android is one of the most used mobile operating system all over the world almost everyone now have mobile phone and most of them are using android as the open source operating system. a network administrator would really enjoy using nmap on his phone maybe it can't do all the job but for sure it will do a good part of it , i mean the first step ! why this app is not being updated ?